An Englishman in Colombia: Word of Warning! It doesn't matter how careful you think you might be, there is always room for error! 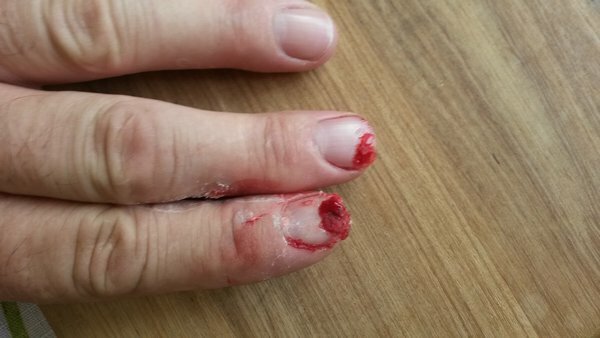 This morning I was making some wooden sanding blocks on the table saw, I thought I was being careful, I was using my push stick to keep the blade away from my hand, but saw I was about to have a kickback, where the saw throws the timber back at you, in doing so I tried to get out of the way. I honestly haven't a clue what happened, I just know that one minute my fingers were intact, the next I was minus one finger tip, and a slight injury to another, fortunately it was just skin, flesh and nail, no bone. Into the house and called my wife, to get the Superglue from the Medicine cabinet, having washed the wound, and dried it, Marcela then squeezed as much superglue onto the wound as she could, whilst at the same time I was trying to stop the bleeding long enough to cover it. A few seconds later, both fingers were suitably doused in glue. Other than looking a mess, it was sorted, fortunately I learned a long time ago to keep a tube of superglue in the kit for such occasions, obviously hoping it would never be needed, at least it saved a hospital visit. Now I have a matching pair, about fourteen years ago, maybe longer, I cut the tip off the same finger on the other hand, I still get nerves tingling to this day, especially when the weather changes, I guess that now I will have a second opinion!!! On that occasion I was distracted by someone else, this time there was only me. If there is a lesson to be learned from this, it is to be careful at all times with any machinery, but however careful you are, and I consider myself very cautious, accidents happen, just be prepared in case. My advise to anyone working with machinery would be to ensure they always have a fresh tube of Superglue in their first aid kit, fortunately I had replaced mine in the last two weeks. Superglue, was first invented for the military, to use in the field on wounds such as this, it forms an instant seal to the wound, stops bleeding, and if you are lucky and exclude all air, prevents you feeling much pain, I was lucky, I have a slight throbbing tonight, but otherwise I have felt nothing...so far, and it is now eleven hours after the event. I think the pain will be removing the gauze when I pluck up enough courage to check on the wound. At least I have an excuse for not working for a day or two!